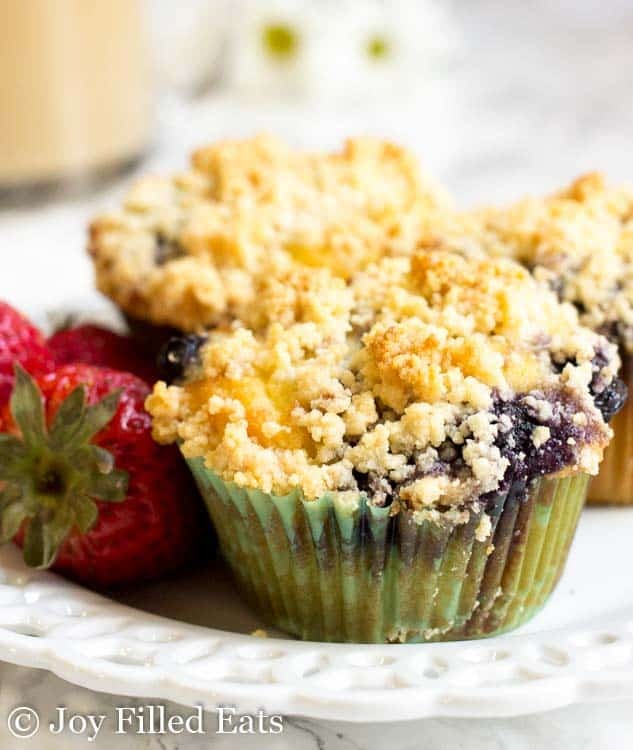 These blueberry muffins with crumb topping are the perfect grab-and-go snack or make-ahead breakfast. If you are looking for a healthy and wholesome delicious blueberry muffin recipe you have come to the right place! I’m going to admit that out of all the types of baked goods muffins are near the bottom of my list. If I had a choice between a cookie, a brownie, a slice of cake, cheesecake, and a muffin you better bet that muffin is the last pick. 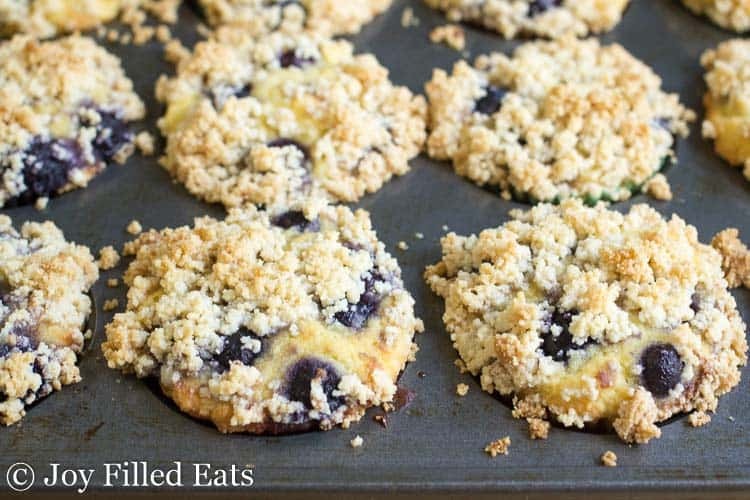 Unless it is one of these healthy blueberry muffins with crumb topping. 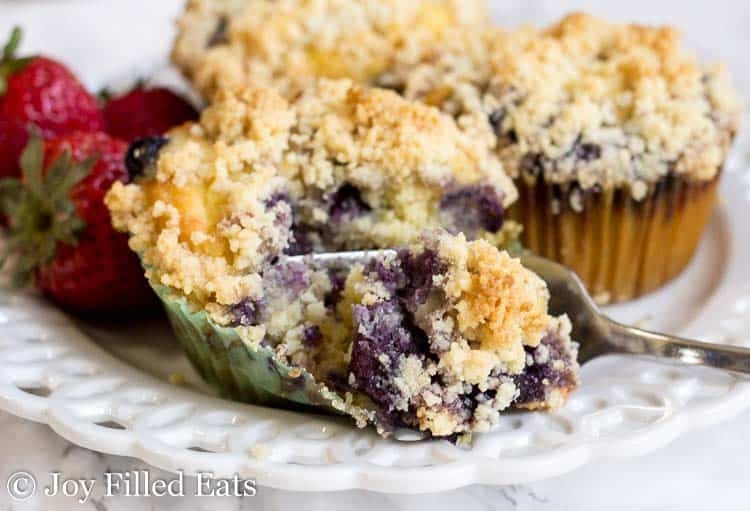 Adding the crumb topping makes this blueberry muffin recipe straddle the divide between being a muffin and being a crumb cake. It is healthy enough for breakfast or a snack but indulgent enough for dessert with a cup of tea. These are based on the Cranberry Orange Muffins and Pumpkin Muffin Recipes I made last fall. Whenever I want to bake something new I look back at a few of my older recipes and combine and tweak as necessary to vary the taste. When I decided I wanted to make a blueberry muffin recipe for my blog I knew two things. The first was that I wanted it to be dairy free (I’m trying really hard to break my weight loss stall after my fall baby arrived last year) and that it needed a crumb topping. 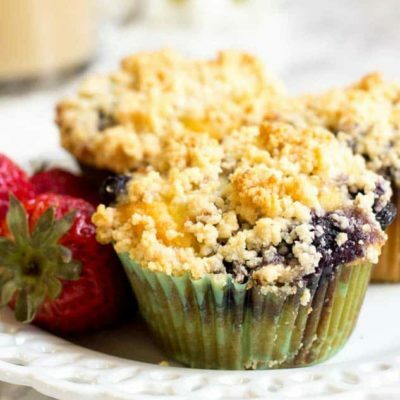 How to make blueberry muffins? My method is super simple. I just process the batter ingredients in the food processor. You can omit the crumb topping if you want to save a step and cut back on the calories or carbs. They are delicious with or without it. After making the batter and scooping it into the muffin tin with a large cookie scoop I divide the blueberries between the muffins. That way I’m positive there is a blueberry in every bite. Then you pulse the crumb topping ingredients in the same food processor (no washing necessary!) and scatter the crumbs on top. 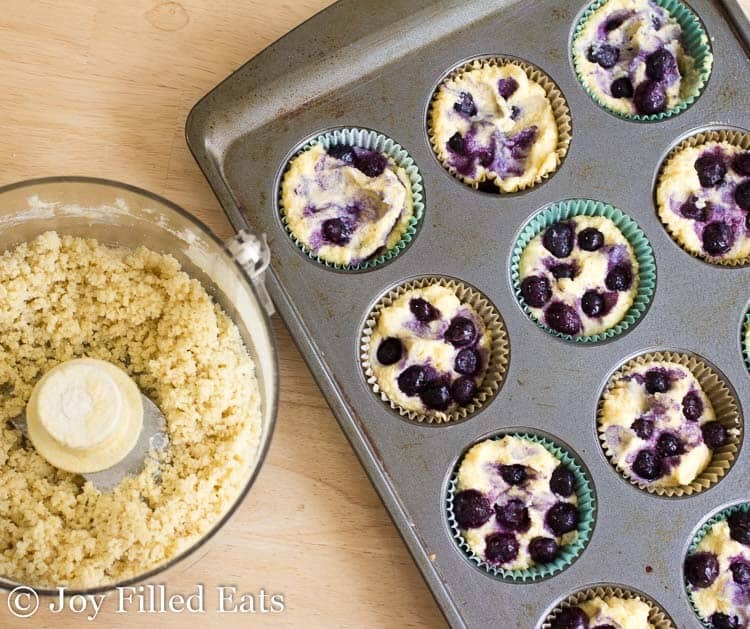 Pop the tray in the oven and about 30 minutes later you have delicious healthy blueberry muffins. 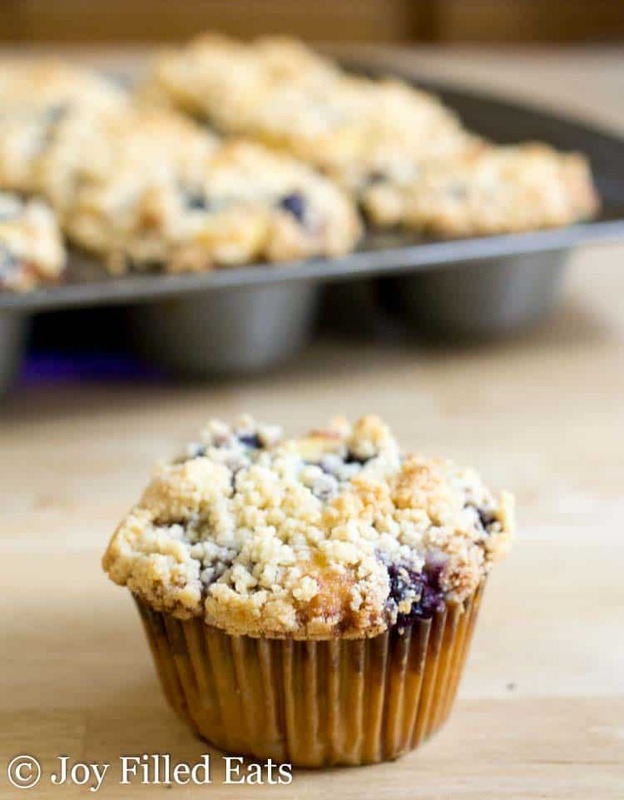 I hope you enjoy these homemade blueberry muffins with crumb topping! Add all the muffin ingredients (except the blueberries) to a food processor and pulse until smooth. Divide between the prepared muffin tins. Divide the blueberries between the muffins and press down slightly. Add the topping to the food processor and pulse until crumbs form. Do not process too long or it will turn into a dough. Scatter the crumbs on top of the muffins. Bake for 30 minutes or until golden and firm to the touch. If the crumbs are getting too brown you can loosely cover the tray with aluminum foil. 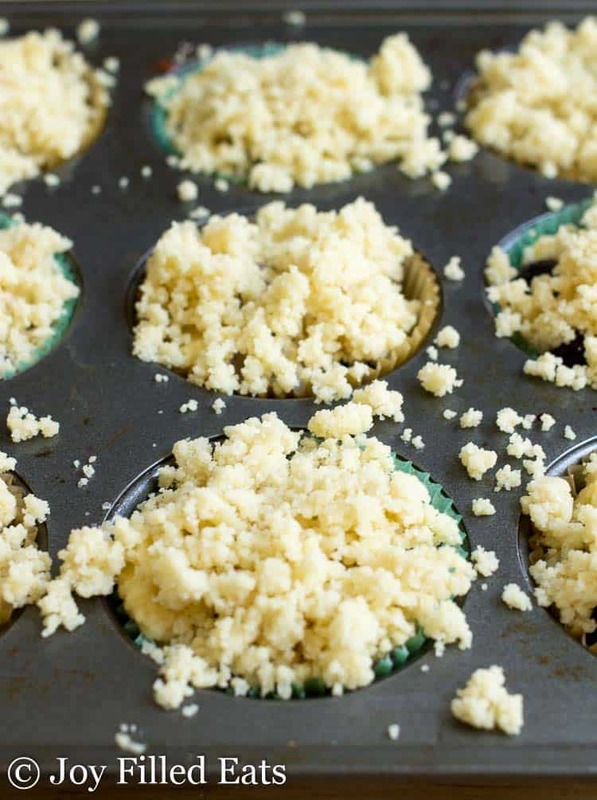 If you'd like to reduce the carbs or calories you can leave off the crumb topping OR just make these into muffin tops by having the batter and baking in a muffin top pan. That way you still get the crumb topping but reduce the carbs by almost half. These look amazing! Can I use honey as the sweetener? Maybe. I haven't tried it and I'm not sure how it would work in a crumb topping. I made these for my breakfast this morning and shared with a friend! So yummy! Thanks! 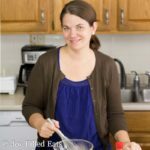 do you know if I can use GF flour instead of Almond flour? I'm still getting used to baking with GF flour and am not sure how the substituting works. Thank you! To be honest I'm not sure. What are the ingredients in the gluten free flour you'd like to use? I just did the nutrition facts on my own and got somewhere around 3.75 net carbs, 26 grams of fat, 8 grams of protein, and 295 calories per muffin with the crumb topping. Why is that? I'm not sure. Did you use MFP? There could be an error since it is a user entered database. These were delicious! I used 1 cup THM Baking Blend in place of the flours and stuck with almond flour for the topping. I will be making these over and over! Anything I can substitute for the gelatin? I'm vegetarian and don't use it. Can I use butter? Hi Robin, You can just omit the gelatin. It helps the crumb topping get crispy but it isn't absolutely necessary. It should be fine to use butter instead of coconut oil. 😀 Thank you! Eager to make them! Would it just be 1 muffin for a breakfast? That is up to you. I find these pretty filling. One plus a cup of coffee and I'm good. If you want to add more protein without a lot of calories you can pair with an egg white and veggie omelet. Yes, I used frozen blueberries in these. These sound so yummy! I am confused by the nutrition information, the carbs are way above an S range - everything seems really high. They use a lot of almond flour. I give suggestions in the post to reduce the carbs. 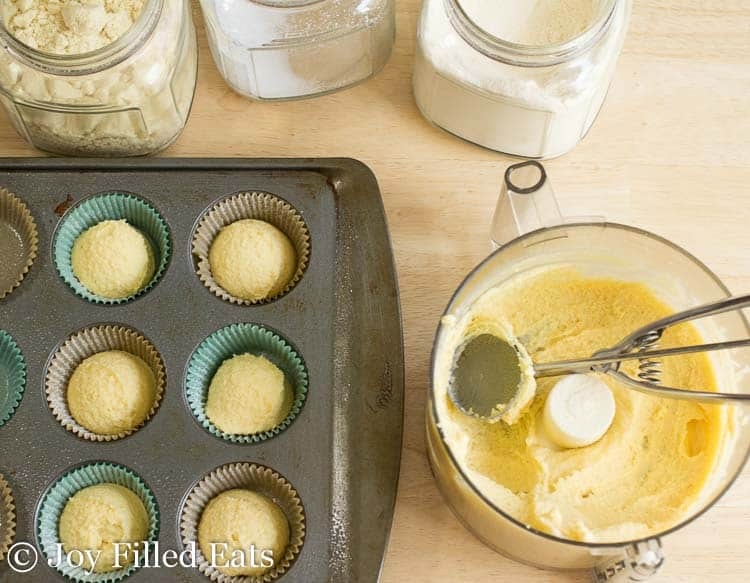 You can leave off the crumb topping or just make half the base and bake them in a muffin top pan. Raspberries and blackberries have less carbs than blueberries too so feel free to sub in those. And these are ok for an S because you subtract the fiber. They have 9 net carbs. You could also sub in baking blend. Can you sub THM Baking blend? If so how much? Definitely in the base. Use a little less. I think the crumb topping will come out better using the almond flour. These have become a firm favourite in our household. The kids have requested that I make them at least once a week since trying the recipe. I personally LOVE the crumb topping it's my favourite bit. Great recipe and perfect for snacks, treats and breakfast. These beautiful muffins reminded me of the muffins you'd see in a bakery. The streusel topping has the perfect texture too. My favorite part, in addition to their incredibly delicious taste is that they are low in carbs. Such a wonderful recipe - thank you!